Includes 20 each M4 and M6 hex nuts and 20 each M4 and M6 square nuts. Bolts include (22) 6 x 3/4", (10) 8 x 1/2", (5) 8 x 5/8", (7) 10 x 1/2", (3) 10 x 1-1/4" and (3) 1/4 x 1/2". Nuts include (22) M3, (15) M4, (10) M5 and (3) M6. Includes (10) push pins, (50) thumb tacks and (15) paper clips. Set includes: (30) 4 x 1/2", (25) 6 x 1/2", (15) 6 x 3/4", (10) 8 x 3/4", (10) 8 x 1" and (5) 10 x 1". Includes (40) 4 x 1/2", (28) 6 x 1/2", (20) 5 x 5/8", (5) 8 x 1" and (2) 10 x 1-1/4". 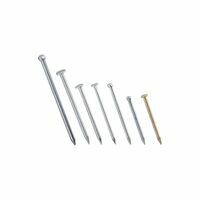 Includes (13) 8 x 1" and (17) 6 x 1"sheet metal screws and (13) E6 and (17) E5 anchors. Midwest Nail Kit, Assorted Durable and reusable container with assorted sizes of eye hooks, cup hooks and shoulder hooks. Contains enough items to complete multiple projects. 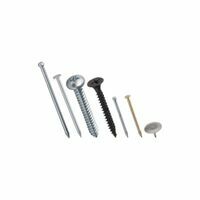 Durable and reusable container with assorted kinds and sizes of screws, bolts, washers and nuts. Cotter pins are commonly used to retain clevis pins, sprockets, wheel axles, pulley & flywheels. Contains 120 pieces. Durable and reusable container with assorted types and sizes to complete multiple projects. Durable and reusable container with items such as picture hangers, anchors, push pins, cup hooks, nails, brads and screws. Durable and reusable container with items such as anchors, toggle bolts with wings, bolts and screws. Contains enough items to complete multiple projects. Durable and reusable container with assorted types and sizes. Contains enough items to complete multiple projects. Durable and reusable container with multiple sizes nails, tacks and brads. Contains enough items to complete multiple projects.